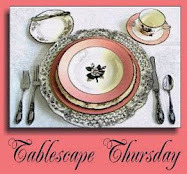 It's time for another Tablescape Thursday with our charming hostess, Susan of Between Naps on the Porch! I'm also participating in Mosaic Monday for the first time. Stop by Mary’s dear little red house to see other mosaics. I've set a table for you on this chilly afternoon. I hope you don't mind that we're not in the dining room. It just seemed more cosy and casual to use the den (yes, the den ... I can't get used to saying "keeping room," although I know that sounds FAR more fashionable). I moved out a few chairs and occasional tables, pushed the sofa against the wall, set up a sturdy folding table, and brought in mismatched chairs from adjoining rooms. If you've visited before, you know I enjoy setting tables with dishes from companies like Haviland, Lenox, Royal Doulton ... and so on, but not today. No damask linens either ... I just tossed an old-fashioned cotton bedspread (the kind our mothers and grandmothers used to have) on the folding table. The dishes are from Goodwill, and the roses are the "Charlie Brown Christmas trees" of the floral world. "If the tabletop reflects confidence and deliberate style, no one will question the table." By the way, if you haven't visited Jason's beautiful website, check it out HERE. Be sure to read about the collections and view his portfolio (click on the main photograph, and it opens a .pdf). The photography is amazing! He's as nice as he is talented, too. Thank you to Valorie, the Visual Vamp for bringing him to our attention HERE. The afternoon sun's coming in. I thought peachy orange roses would compliment the blues of the plates, glasses, and napkins. The candles are recycled from last week's table. These T. J. Maxx clearance tapers have tiny gold flecks on them. I mentioned that the plates are from Goodwill. They were 50% off the already low price. The blue diamond-patterned glassware is an estate sale bargain (8 for $6 on day 2 of the sale). I don't know the maker or the pattern, but I think they look festive. 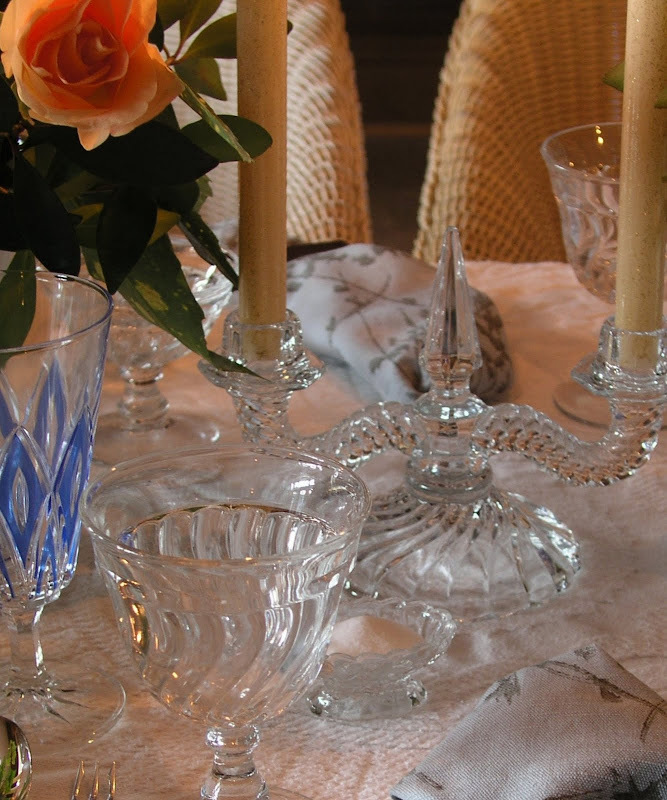 The low water glasses, sherbet dishes, and the candleholders are Colony by Fostoria. The pattern was produced from 1940-1973. It's a heavy, sturdy design that fares well in the dishwasher. I decided to skip my usual silver candleholders and use glass ones today. Note the Colony salt cellar below. It was a bargain at a local antique mall (the dealer obviously didn't know the pattern). The sherbet dishes came from the same mall. The pattern wasn't listed on the label, and they were priced at only $2.50 each (less then some Wexford pieces in the same booth ... NOT that there's anything wrong with Wexford , but Fostoria's usually priced higher). It really pays to keep your favorite patterns in mind when you're browsing in antique shops and malls (and in thrift stores and estate sales). You never know when you'll find a bargain! Normally, a glass-topped coffee table sits underneath the light fixture (the table serves double duty, helping to prevent tall folks from walking into it!). It's suspended from a beam that runs the length of the room. I wound the clock and set it just before I started taking pictures ... but failed to start it properly. So ... you might notice that (it appears) I took many of the photographs at the exact same moment. I'll admit that I'm not normally a fan of milk glass, but I think these 99 cent thrift store purchases work well as flower containers on today's table. The oil painting with the black vase and fruit is one I did as a demonstration for a local art group. It was a lesson on backgrounds I did from memory of a Helen Van Wyk televised demonstration. If you don't know who she was, and you're interested in painting based on classic principles, Google her. She was quite a lady, such an inspiration to so many aspiring painters! I've read that napkin rings originally were used so each family member, with his or her own napkin ring, conserved soap and water by reusing the same napkin for many meals. These days, fortunately, they're purely decorative! These dozen roses were reduced to only $2.99. I almost didn't buy them, because they looked so awful! I removed lots of drooping outer petals to give them a quick "face lift." The greenery is from the garden. I re-cut the ends of everything before placing it in wet floral foam (oasis), which I'd pre-soaked in water. Not bad for over-the-hill, bargain roses. Do you agree? There were actually only 11 ... hmmmm. Perhaps one had disintegrated completely! I used dishes and glassware that are dishwasher-friendly, but I DID use the good silver. This table is set for a company meal after all! It's La Scala by Gorham (still an active pattern). Some people put silver flatware in the dishwasher, but I never would. To me, it's not with the risk of damage. The dishes are Charter Club's Country Chateau, made in Portugal for Federated Department Stores in the 1990s. I purchased 12 dinner plates, 12 salad plates, and 12 bowls for just under $10 at Goodwill. One dinner plate (the solid white version of this pattern) goes for $47.99 on Replacements.com! Not quite dark yet ... but let's light the candles. It's amazing how burning candles and faded roses can make a folding table in the den ... set with Goodwill dishes ... on an old bedspread seem almost romantic, isn't it? Hope you've enjoyed stopping by for dinner in the den! I take a LOT of pictures for you each week. Is this a mosaic gone mad? You're up to some changes aren't 'cha? You're BLOG looks really nice. I love all the elements of this casual table. Great job as usual and the roses look wonderful. What a wonderful look you achieved here, Bill. 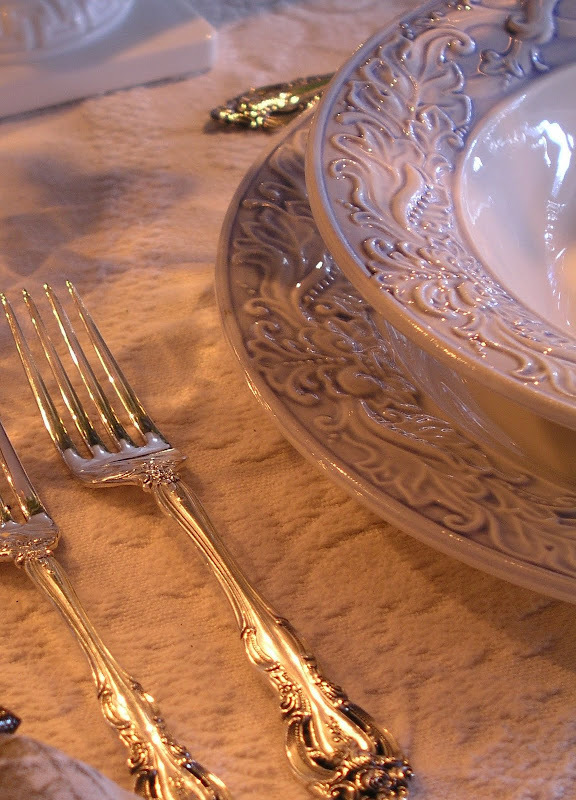 I love the tablecloth/bedspread and the beautiful dishes. I never have this sort of luck at Goodwill. You manage to show us incredible bargains each week coupled with your extensive collection of vintage pieces. I so enjoy that. Love what you did with the roses. I never would have thought! I took a little hit yesterday for posting a picture with a Christmas wreath still up. Well...it's still alive!!! Your mosaic is awesome. I may need a few tips form Susan as well! I am so glad you added the blue goblets. I love all things blue! I think they played off the roses well. Bill, I loved this. You really did achieve an amazingly romantic look, and the prices you find things for is astounding! Good job! The photographs are stunning as usual. This was a nice respite in an otherwise hectic and crazy day. I'm still not back to blogging, but I hope to be soon... maybe next week, though Claudie is coming to visit from Canada along with her friend Julie. I'm so glad I checked in to see who was posting tonight. Thrilled it was YOU! Did a double take on the title! It was funny to me--I have a weird sense of humor sometimes! My grandmother had Gorham silverware and it is now mine. I don't know the pattern, but think it is an older one. 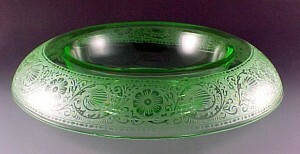 Thanks for coming by to look at my Towle bowl. I appreciated your comments. Thanks for sharing! Beautiful! I love how you've made faded roses, thrifty dishes and a folding table look like a million bucks! Oh my gosh I have to tell you that everything looks so beautiful on this table setting. I love using bedspreads and quilts as a tablecloth, you know me you have seen several quilts already. Your dishes are exquisite. So beautiful, and my word I do love those glasses with the blue panels on them. How beautiful they are. I love the use of the hair clips, that one is original for sure. Looks so beautiful. I was looking as I was reading trying to figure out what they were, I finally came to it. I love the painting that you did. I did not know that you painted. Bill that painting is beautiful, just beautiful. Thank you for sharing it with us. I love that mantel clock too. Gorgeous. P.S. I have to share with you, my pink hat that you so love, this year it adorned the top of the Christmas tree. It looked so pretty and the grandkids loved it. I know how much you have always loved my hat. Bill -- your table is perfect as always -- it is a beautiful table and I love everything about it. You set one elegant table -- you always do! Another beautiful setting!! I love seeing the beautiful items you get at estate sales, and at great bargains. I had read that about the napkin rings. :) I have never seen that good of a bargain on roses at the grocery before - will keep looking. Sorry about the leak!! I go into a panic mode on things like that. I checked out estate sales in the area for last weekend, but backed off. I am working on cleaning out instead of adding. Recently packed up 7 piece place settings for 12, with extras & serving pieces of china that I have not used in years. Your home truly reflects your warm & generous spirit & every turn seems to bring another aspect into view. What a wonderful room to be able to relax by the fire & dine! The sunlight coming in across that floor is just dazzling & sets the entire room aglow! I want to peak around every corner to see what's coming next. The blue & peachy colors you chose work beautifully together & I really like the similarities of the roses & the beautiful painting above the fireplace. Did you paint that one as well? Thank you again for an exceptionally charming tablescape with bargains galore to envy. I want to go shopping with YOU someday! Thanks for sharing another gorgoues table. As usual, your table is gorgeous. But this time, you have incorporated a casual, yet elegant table that would be perfect for both family and company. I love the bedspread...one of my favorite table toppers. And the touches of blue (not one of my favorite colors) are perfect! As I look at this tablescape, I am transported back to the home of a dear friend in Texas. She would set her table in a similar manner...before she left for church on Sunday. At church, she would look around for "someone who needed to be with company", then invite the person...or whole family...to her home for a simple lunch. She would serve a soup or maybe a salad. Often, the meal consisted of warm croissants with cheese and sliced fruit. She always maintained that the food may be simple, but the table setting made a guest feel special...and the meal would taste so special. HI Bill. Another beautiful tablescape this week. The roses still do well in your pictures and that little bit of blue in those glasses does go well with the rest. Hi Bill! You got a deal on those Goodwill dishes! Yes, it is very romantic. I never knew that about Europeans and napkin rings...interesting. That picture of the huge rose reminds me of my mama. She absolutly loves roses. Oh, your work is a treat for the eyes, heart and soul. Beautiful! Thanks for sharing, I'll be back often. I stop by often to get my fix of style & luxury on a shoestring, not always commenting but you are the best my friend. With mosaics as great as these you must join Mary @ thelittleredhouse for Mosaic Mondays. It's a great place to learn. Hi Dear Bill! Oh, you did a wonderful job on your mosaics! Now I'm amazed again at your gorgeous table! You say 'not so fancy' - whoa! It's so lovely! Your different pieces all mix so well. Now I'm loving seeing little tads more of your beautiful home! Bill, as usual you have treated us to another amazing tablescape. I love the blue and clear with a touch of orange/peach and the white vases. Your attention to detail is so good and I find myself taking notes and studying every single photograph. You take wonderful pictures and I love the mosaic. Thank you for such a beautiful table. Where to start...my favorite part of this tablescape, the blue goblets. It is the way they catch the light and seem to glow on the table that really catches my eye. Next...that stunning painting above the fireplace, did you do that one? I can't take my eyes off of it. I love the china, it is similiar to the square ones I used in my tablescape this week. Mine were a recent purchase at TJ Maxx for $3.99 a plate...you got such a deal. Everything as always is warm, inviting and very tasteful. As always, yours is the first table I go to, and always so rewarding. Thank you for sharing the great finds you have. I live in a small town in a poor county so there is hardly ever any Goodwill finds of the claiber you have. I guess that's the problem with living in a "young" state. Thank you for the inspiration. Bill, I always look forward to your tablescapes because I know they will always be beautiful. This table definitely lives up to my expections. I am in love with the blue diamond glasses! Bill, I doesn't seem to matter what room you set up or what dishes you use, everything you do turns to gold. This is a great one. This room and setting is absolutlely glorious and these images look like they have come out of a beautiful interiors magazine. 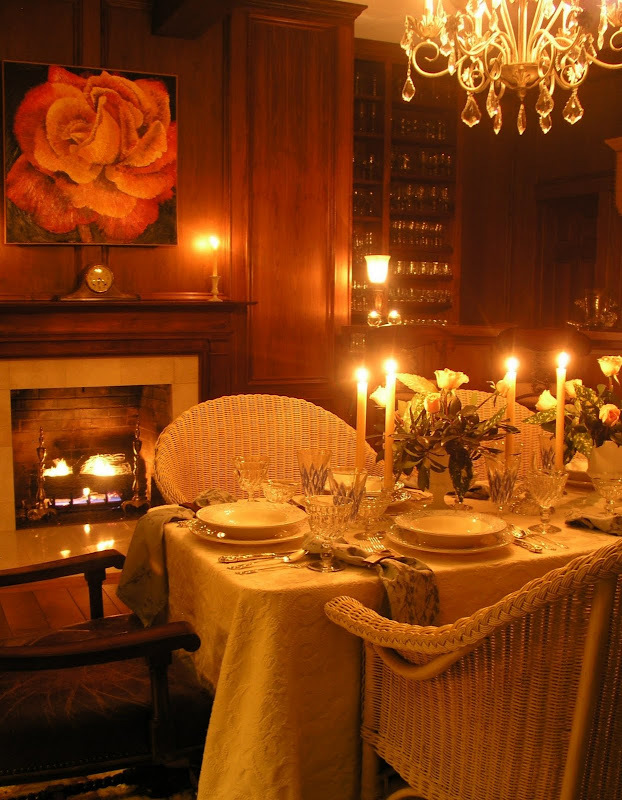 You are so fortunate to have so many wonderful spots in your home to entertain. I'm going quietly crazy over here in Oz as I just don't have the room for all my things, especially my tableware which is now ending up in storage boxes. This is just another breathtaking table that shows how talented you are! Every photos looks like a magazine. Love the Fostoria especially, and I cannot believe the Goodwill dishes. Your floral arrangements are so perfect for such an elegant table. Thank you SO much for stopping by last week. I admire and am so inspired by everything you do so much!! Great job on the mosaic! I am just learning how to do them myself! I love this table; it's simply wonderful. Great idea with using the old-fashioned cotton bedspread for a table cloth! I actually really like those old bedspreads--they remind me of my grandmother's house, since every bed in the house had one! I really like the subtle blue with the peach roses; a great color combo! I always feel so welcomed at your tables. They call out to me. I especially like the textures of this table, the rim of the dishes and the reed of the wicker chairs, that heavy textile over the table, the mix of crystal and milk glass....it is all a visual treat. Great job on the mosaics! Bill, another magnificent tablescape! I LOVE the dishes and the blue glassware. Really nice candles and the roses and greenery make a lovely centerpiece. You're a great designer, Bill. "A" for "A"ffordable" "A"ccoutrements, and "A+" for Bill, not that I'm in any position to grade, but this "Den-Din" tablescape is to "Dine" for!,another fantastic scape, Bill your pictures are amazing!, The roses have the "perfect-petal" lift, don't we just love to buy bargain flowers and give them a chance to sparkle and shine! Each week you out-do yourself. Just gorgeous. Is that a Georgia O'keefe over the fireplace, or one of your own paintings? It's wonderful..
First of all if anyone noticed the clock and dared to comment about it I would personally go over to their homes and pinch them. I like that most of this was very affordable and still looks fabulous. Of course the name of your blog should have made that clear. Fabulous tablescape, Bill! I love your dishes from Goodwill and how you used the bedspread as a tablecloth. The fireplace, candlelight, gorgeous chandelier and those beautiful roses create such a romantic ambience. Not sure if you'll come back to check for a response, but I didn't see an e-mail address for you on your profile. I wish I could say I did the painting of the rose, but it's one my friend, Yvonne, painted a few years ago. Dramatic, isn't it? I just love your wicker chairs. Your table is so inviting. I have never seen dishes like that at our Goodwill! What?? You paid WHAT for all those dishes? Just amazing! They are perfect with those glasses, and peach roses, who would have thought! I am coming to your GW, really..just amazing.. I love the coziness of the table with the sun streaming in.. I like napkin rings though, a little jewelry even for every day! I don't suppose you have anything for St. Patrick's Day do you? I am having a Blog crawl on the 16th, and I'd love for you to attend..So dig out the Waterford and Belleek, I know you must have some! 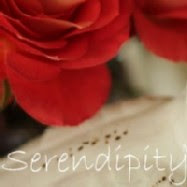 PS: Thanks for following me--I am now a loyal follower of Affordable Accoutrements! As an European I would like to say that I always put clean napkins on the table of which I have a good assortment, I also have a variety of napkin rings!! Even for afternoon tea I always use linen napkins never paper ones. I have a coule of Ralph Lauren tablecloths and napkins that I have bought at TK Maxx and also some lovely napkins from a fellow blogger from her Etsy shop in the USA! ( Goodwill) shops and see if I can get some wonderful bargains like you. When I was in the village the other day I saw two glass hand painted Lenox plates at £2.00 each, should I of bought them? Love the painting and the clock as well as that lovely tablescape. Jackie. Bill, Bill, Bill! You're killin' me! LOL! Just when I think that you've created my favorite tablescape...you do it again. I can't tell you how inspired I get just from your tables alone! You truly have a gift and I'm thankful that you share it with us! BTW, this part of your home is wonderful! I love all the pix, Bill. And the bedspread is my all-time favorite! I'm a fairly new "lurker" to blogland but I just had to say that I look forward to your posts and thoroughly enjoy them. You have such an artful eye & hand, the photographs pull me in, and your collections are wonderful! Oh, Where do I start? This is a stunning room with the beautiful wood floors and the paneling. Makes me want to grab a glass of port and a good book and sit for a while. The rose above the fireplace is smashing, did you paint it? I adore the colors! I love a bedspread as a tablecloth because I love the weight of it. Same reason I use a quilt. Your silver flatware is a lovely pattern and just for reference, sometimes a piece of mine gets lost in the mix and goes into the dishwasher and you know, it comes out OK. I wouldn't want to make a habit of it but just saying. I am amazed that you put your Fostoria in the dishwasher. It too doesn't look any worse for it. In fact it's sparkly and lovely. Bill, have a great weekend and thanks as always for your lovely comments. I think this is my favorite! Love the wicker chairs to the bedspread tablecloth. Have a great evening! Bill you have a real knack for setting a causual table that still has an elegant and rich feel. 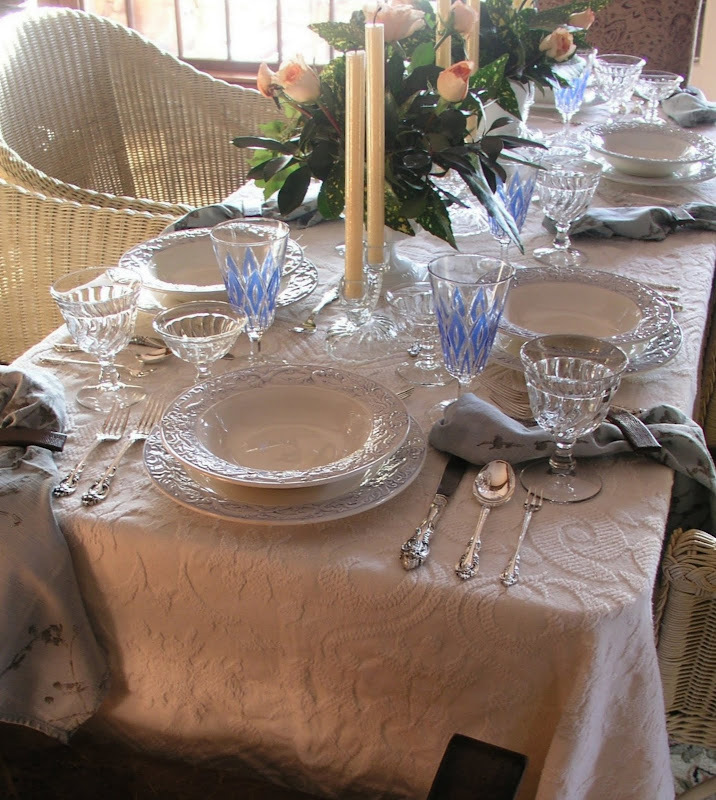 The coverlet is lovely on the table and those dishes are fabulous!!!! I love the way the light lends a softness to your table. Just perfection. The rose color compliments the blue in your table so well. As usual a delight to visit you. 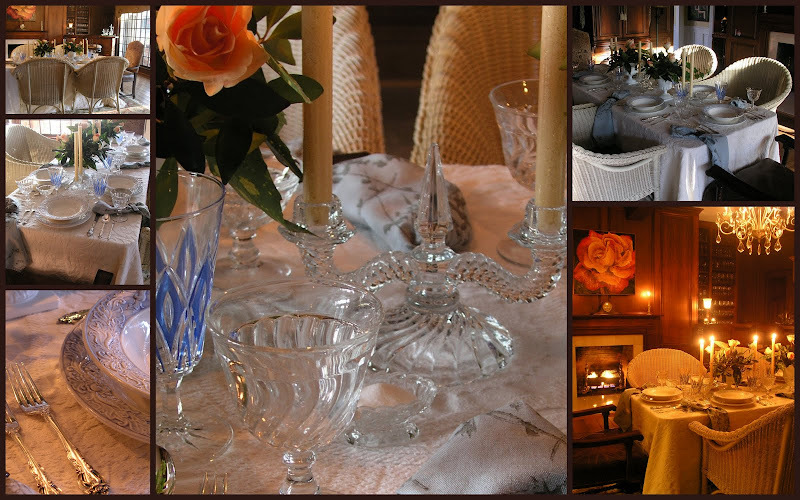 Oh Bill, yet another lovely tablescape and what a beautiful setting in your gorgeous den! I also used a bedspread as my tablecloth, it was crocheted by my grandmother! 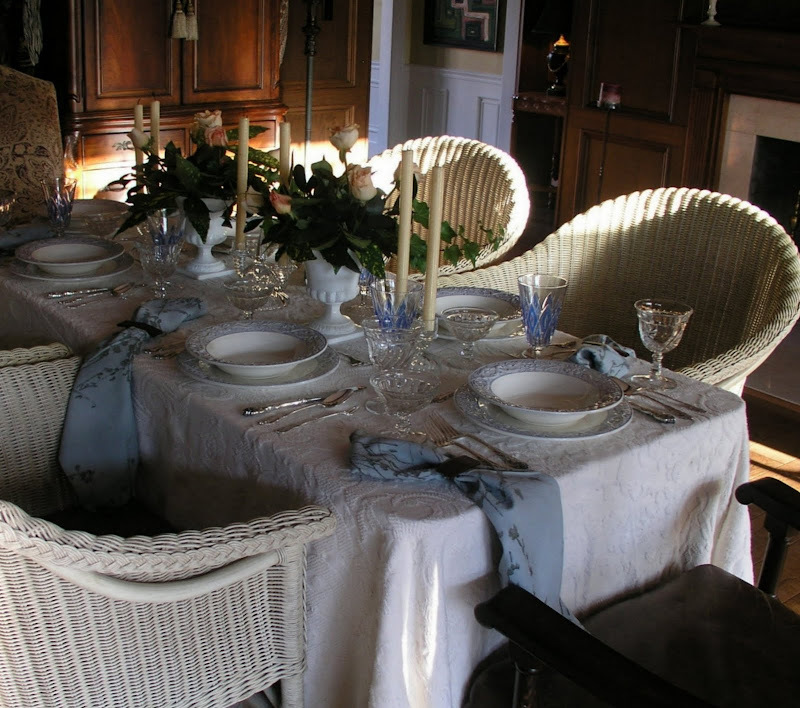 I don't think it's the cost of the china, the linens, or even the crystal and silver, but the ability to set a table that is welcoming and tastefully executed! And your is all those and more! Den-Din!!! Love the name, love the tablescape! I was expecting a masculine look, but it is so elegant and lovely! The blue with the peach roses is so gorgeous! Your black vase painting so really nice! I have that same frame, but smaller. Love the mosaic gone mad! LOL! Recently I was working on a mosaic and somehow unintentionally made a mosaic with every picture stored on my computer!! Yikes! Believe it or not it looks good, but I haven't used it for anything! Just lovely. I love the way you took the photos as the time passed...playing with the daylight and then into the evening with candles. I repeat...just lovely! Come visit me at BellaCasa if you have a tea set up your sleeve. Will be looking for you there. What a fantastic post. Your tablescape and the pictures of it are gorgeous. The room looks warm and welcoming. I particularly love the blue streaked crystal. That was gorgeous. I'll be cack often to see what you're up to. 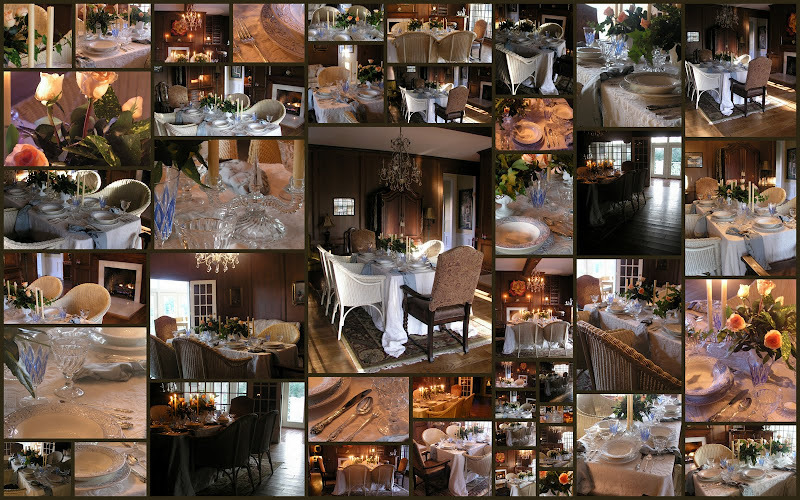 Once again an absolutely stunning tablescape and you have certainly mastered the mosaic. Thank you so much for your kind comments on my Sascha tablescape. I am thinking Fostoria for the glassware. Love every single thing here, Mr. Bill. You just can't seem to go wrong on any of your table scapes. You have the special touch (and beautiful items) to make all of them magnificent. Well, trying to be cute...I stuttered !! The texture going on here is a feast for the eyes. I like the blue goblets they look perfect. I wish I could find dinnerware like that at our Goodwill! I especially love the Fostoria. My grandmother has a extremely large collection of the diamond patterned Fostoria. The name escapes me now. But I like the Colony better than hers. So pretty and I love the weight of it. Just feels rich. You are also a very good artist. Beautiful table in the den! Well what time should I be there! :) perfectly lovely and warmly inviting! Really well done all around! thanks for visiting and following me, Bill, it's nice to meet you! Bill, this is gorgeous, as always! I am now trying to remember where I put that old bedspread that is similar to the one you used o the table. Brilliant! That blue stemware and that china were incredible bargains, and they make such a pretty setting. The milk glass urns with roses are perfection. Now, on to the things that were not on the table that I loved, i.e., those wicker chairs; those window valances; your painting. Wow, Wow, Wow! As usual, I'm blown away by your talents! I'd love for you to attend..So dig out the Waterford and Belleek, I know you must have some! Bill, this is such a gorgeous tablescape! I love your Goodwill dishes..very pretty. I especially love how you've draped your napkins on the edge of the table. Very classy! I am in love with those dishes!! I saw a similiar pattern but I am in the window shopping phase of my life right now! Your table is delightful! Another wonderful job!! Awesome tablescape, Bill. It's great to see you step outside your typical scape. The texture of the "tablecloth" is spectacular. It goes so well with the dishes - great bargain. The touch of blue in the glasses is the finishing touch. That's a spectacular room. Beautiful fireplace accented by the light streaming in. Just great. You are one multi-talented dude, and a most savvy shopper besides. Now, don't you go downgrading that bedspread! I bought a whole bunch of them once upon a time to use for summer slipcovers. I have made a round tablecloth out of one of them by removing the fringe, cutting the round and then reapplying the fringe. It came out as perfectly as if I had planned it. I also have one of those spreads on my bed because I like the bed linens to be washable. Your whole scenario is a work of art. (I like your painting too) I think you win the Grand Prize again! I especially love the Fostoria. My grandmother has a extremely large collection of the diamond patterned Fostoria. The name escapes me now. But I like the Colony better than hers. So pretty and I love the weight of it. Just feels rich. You are also a very good artist. Beautiful table in the den! Simply stunning. This is really my kind of comfortable setting and you have used the funds wisely. Kudos to you. I must correct you though. This table is not ALMOST romantic. It simply IS romantic. *sigh. Welcome to Mosaic Monday Bill.Lovely table and mosaics, or as us in the UK say 'Collages'! !I am now going to look up "keeping room" online, I think I prefer the word "den" I understand it more!! The peach roses are delightful, do they ahve any "smell"/ perfume?? Jackie in UK. So beautiful. Your guests must feel very special. Lovely table setting! What time is dinner? I am always inspired by your beautiful tablescapes. I am so glad you told what the "tablecloth" was--I was wondering and it looks so beautiful!!! I love the wicker type chairs too, such a nice combo. Your attention to each detail, no matter how small, really pays off. You've created something quite lovely and most welcoming! I'll dine with you anytime! The spectacular table is a visual feast -- the kind that fills me up. Gorgeous as ever!! I expect to see Rhett and Scarlett coming thru. Thanks for coming by my blog. I had oodles of fur woth this one. Sorry can't stay long there's a storm watch out and I gotta get to gettin before they start. Roses are great... table cloth is something outclass. and and more and more STARS for everything......... really makes my heart sings... beautiful Bill. Bill, I wasn't blogging yet when you posted this tablescape, but I discovered it today... and it's still bringing smiles in Blogland -- and in my home even on this dreary, rainy day in East Tennessee. I hope you're having a good one!